Warning issued about oil shipped from ND, Mont. BILLINGS, Mont. (AP) — Following a string of explosive accidents, federal officials say crude oil being shipped by rail from the Northern Plains across the U.S. and Canada may be more flammable than traditional forms of oil. A safety alert issued by the U.S. Department of Transportation warns the public, emergency responders and shippers about the potential high volatility of crude from the Bakken oil patch. The sprawling oil shale reserve is fueling the surging industry in eastern Montana and western North Dakota, which is now the nation's second-largest oil producer behind Texas. Thursday's announcement from officials declares that the Bakken's light, sweet crude oil may be different from traditional heavy crudes because it is prone to ignite at a lower temperature. Experts say lighter crudes, which contain more natural gas, have a much lower "flash point" — the temperature at which vapors given off by the oil can ignite. 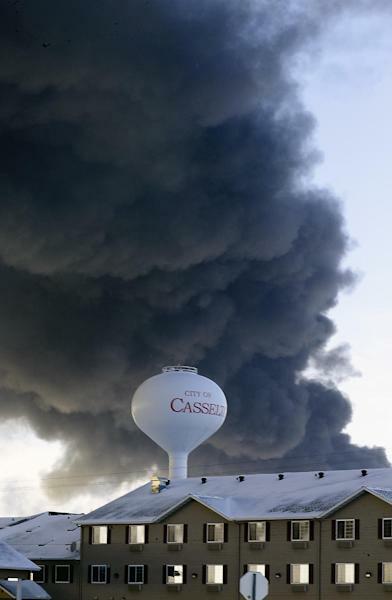 The government's warning comes after a huge explosion on Monday caused by a crude train derailment near Casselton, N.D. No one was hurt, but worries about toxic fumes prompted the evacuation of hundreds of residents from the small eastern North Dakota town. The oil boom in the Bakken has reduced the nation's reliance on imported oil and brought thousands of jobs to the region. But as companies increasingly rely on trains instead of pipelines to get that oil to lucrative coastal markets, public safety in communities bisected by rail lines has become a major concern. In July, 47 people were killed in Lac-Megantic, Quebec, when a train carrying Bakken crude derailed. 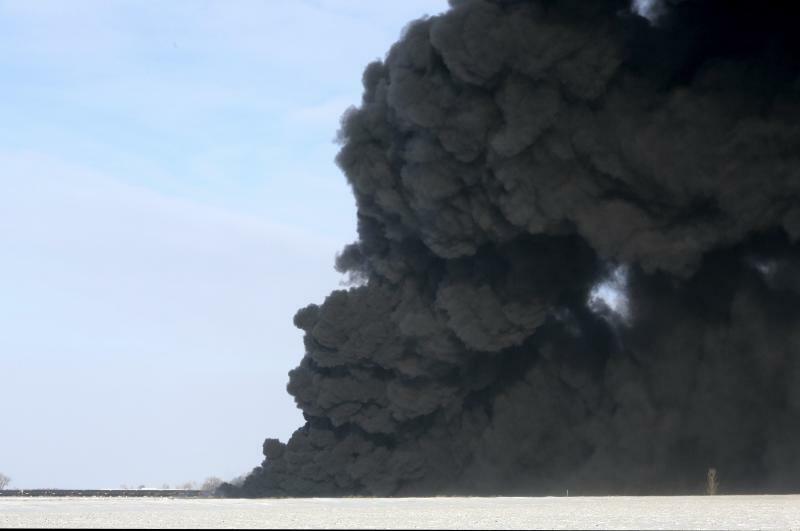 Another oil train from North Dakota derailed and exploded in Alabama in November, causing no deaths but releasing an estimated 749,000 gallons of oil from 26 tanker cars. By comparison, there was no fire when 10,000 gallons of oil that originated outside the Bakken region leaked after a Canadian Pacific Railway derailment in Minnesota last March. Cleanup crews were able to scoop up much of the spilled crude, which the railway said came from western Canada. Whether the government's response to the latest derailment will help stave off another accident is uncertain. While safety advocates welcomed the move, others said the warning didn't offer new information. "It doesn't take a rocket scientist to figure out that Bakken oil is a high-quality crude with a lower flash point — that's what makes it a desired commodity for all these coastal refineries," said Ron Ness, president of the North Dakota Petroleum Council, a Bismarck-based group that represents hundreds of oil industry companies. Ness added that companies shipping oil from the Bakken already were adhering to federal regulations. Casselton Mayor Ed McConnell agreed that there was no surprise in the federal government's assessment that Bakken crude may be more volatile. "The important thing and the intent here is to keep pressure on the federal and state government to make things safer," he added. The amount of oil moving by rail in the U.S. has spiked since 2009, from just more than 10,000 tanker cars to a projected 400,000 cars in 2013. Thursday's safety alert resulted in part from results of preliminary tests on Bakken oil to determine just how dangerous it is, said Jeannie Shiffer with the Department of Transportation's Pipeline and Hazardous Material Safety Administration. Shiffer said knowing the volatility of the oil is crucial so that it can be properly handled during shipping. "The material must be properly classified at the beginning of the process. That determines everything," she said. The issue of volatility is particularly important for firefighters and other emergency responders who have to deal with accidents like the one in Casselton, said Fred Millar, a rail safety consultant in Virginia. He said the dangers of crude have long been underappreciated, and need to be communicated to the hundreds of counties and cities across the U.S. that have seen a surge in crude oil trains. He added that railroads should consider routing the Bakken oil trains around highly populated areas. After the Lac-Megantic crash, federal officials issued an advisory for companies to properly classify their crude oil according to a scale that ranks hazardous materials as a great danger, medium danger or minor danger. Officials have now gone a step further, declaring that the Bakken's light oil — extracted from shale formations through the drilling process known as hydraulic fracturing, or "fracking" — may be different. Kenneth Medlock, senior director at the Center for Energy Studies at Rice University in Houston, noted that the volatility of crude varies from one oil field to the next and is driven largely by how heavy it is. Given that oil is typically shipped in the same type of tank car no matter its volatility, Larry Bierlein, an attorney for the Association of Hazmat Shippers, questioned the importance of Thursday's announcement. Flaws that render the most commonly used tank cars prone to rupture have been known for more than two decades. Bierlein said the public would be better served by the government adopting a long-delayed proposal to improve those cars, known as DOT-111s. "They have lost track of where safety is," he said of the Department of Transportation. 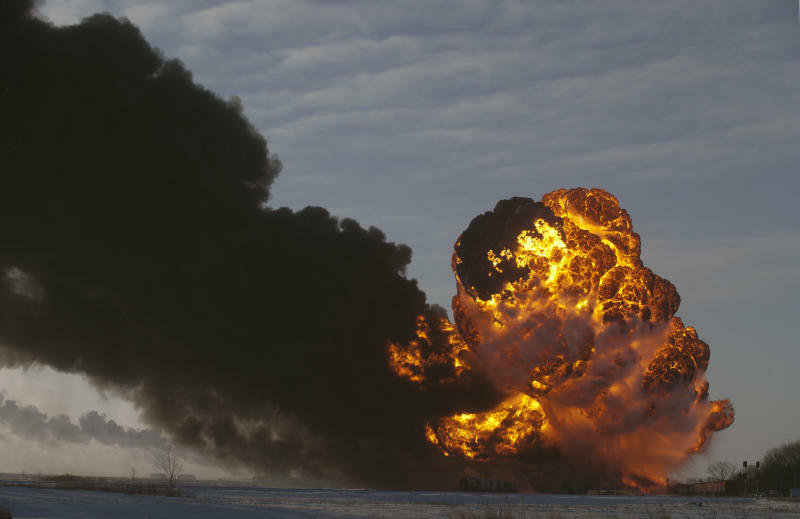 North Dakota regulators had said last month that they were considering crafting a report to disprove that hauling the state's crude by rail is dangerously explosive. On Thursday, state officials said those plans had been dropped in the aftermath of the Casselton derailment. The state's oil production is now pegged at about 1 million barrels daily, and the state's sweet crude is increasingly moving by rail to feed refineries on the East, West and Gulf coasts. State officials said the pace of production likely won't be stunted by Monday's accident. James MacPherson reported from Bismarck, N.D.